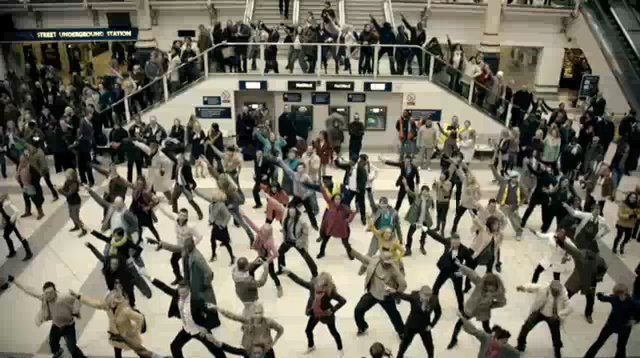 Flash mobs are probably one of the best things to happen to dance recently. They are pure, unadulterated fun no matter if you are watching or performing. It is exhilarating to be a performer in a flash mob and as a spectator, it is exciting to see something spontaneous unfold before your eyes. Although, it’s not actually that spontaneous… at least for the dancers. I once had a person ask me how flash mobs worked. She really seemed to think that people all of a sudden had an urge to break out into dance and that somehow, we all managed to do the same thing. I hate to break it to you all out there, but that is not how flash mobs work. They take quite a bit of planning and coordination, especially when there are many dancers with different entrances. There is also the major factor of unpredictability. If performed outside, there may be wet grass or puddles on your dance floor. If performing in a crowded area, you may worry about the person standing where you should be landing your next leap. In the most recent flash mob I was a part of, I accidentally positioned myself on the complete opposite end of where the group was supposed to be dancing. I had to run half way across my campus quad to get to the right place and I still didn’t quite make it in time. Oops. Even though flash mobs can be a logistical challenge, they are certainly one of the most fun routines that a dancer can perform. This particular flash mob I am highlighting today was filmed in the heart of Times Square and was performed to celebrate the 50th anniversary of West Side Story, an iconic dance musical and movie. And if you are pining for some more West Side Story, the following is a fabulous performance from the Broadway cast on the 2009 Tony Awards.